BROOKLYN, N.Y. -- Attorney General Barbara D. Underwood today announced a 61-count indictment charging David Safir, 48, of Brooklyn; Dr. Alexander Haselkorn, 78, of Franklin Lakes, NJ; Roberta Haselkorn, 61, of Franklin Lakes, NJ; attorney Nadezdha Ursulova, 63, of Brooklyn; and Theron Grinage, a.k.a. Timothy Russell, 52, of Brooklyn for their alleged participation in an auto insurance fraud scheme that cheated no-fault insurance carriers out of hundreds of thousands of dollars. Code-named "Operation Dr. Know," a joint investigation by the Attorney General's Auto Insurance Fraud Unit and the New York City Department of Investigation revealed that Safir, aided by his co-conspirators, allegedly illegally incorporated and operated Brooklyn-based clinic Jamaica Wellness, P.C., encouraged patients to fabricate and exaggerate their injuries, and submitted fraudulent claims to insurance carriers for treatment provided and prescribed by unlicensed individuals. "As we allege, the defendants illegally operated a medical clinic and took advantage of car accident victims in order to line their own pockets," said Attorney General Underwood. "We have zero tolerance for those who try to scam New Yorkers and take advantage of our insurance and healthcare systems – and my office will continue to prosecute those who break the law." New York City Department of Investigations Commissioner Mark G. Peters said, "Medical insurance fraud drives up costs for everyone. This investigation exposes how one scheme resulted in a spectrum of fraudulent conduct, including money laundering, grand larceny and the unauthorized practice of medicine, according to the charges. DOI is pleased to have partnered with the State Attorney General's Office on this important investigation." "The National Insurance Crime Bureau would like to applaud the staff of the New York State Attorney General's Office for their continued efforts in addressing insurance fraud in New York," said Kevin Gallagher, Regional Director of the Northeast Region of the National Insurance Crime Bureau. "The cost of insurance fraud is shared by all consumers and this investigation sends a strong message to others who may be contemplating engaging in insurance fraud. We look forward to our continued partnership in combatting insurance fraud for all New Yorkers." In New York State, a person injured in a motor vehicle accident is automatically covered by the Comprehensive Motor Vehicle Insurance Reparations Act, commonly referred to as the "no-fault" law. No-fault insurance provides for payments for all medical expenses to persons injured in automobile accidents, up to a total of $50,000 per person, when such services are deemed medically necessary and provided by a duly licensed medical professional. Under New York State Law, only a medical clinic owned and controlled by a licensed medical professional can bill for no-fault reimbursement. According to the Attorney General's indictment filed today in Kings County Supreme Court and statements made by prosecutors at arraignment, between July 2016 and July 2017, David Safir, who is not a licensed physician, allegedly unlawfully owned and controlled Brooklyn-based medical clinic Jamaica Wellness Medical P.C. Safir allegedly directed treatment protocol for motor vehicle accident ("MVA") victims, encouraged MVA victims to fabricate or exaggerate their injuries, and paid runners, including co-defendant Theron Grinage, to solicit MVA victims to the clinic. To entice unsuspecting victims, Grinage allegedly misrepresented to MVA victims that he was an attorney. Prosecutors further allege that attorney Nadezhda Ursulova, Esq. aided Safir in illegally incorporating Jamaica Wellness by engaging in a sham transfer of clinic ownership from one incapacitated medical doctor to another. Co-defendant Dr. Alexander Haselkorn was an owner of the clinic in name only and allegedly did not actually treat patients at the clinic. Instead, patients were allegedly diagnosed and referred for thousands of dollars of treatment, diagnostic testing, and medical supplies by Dr. Haselkorn's wife, Roberta Haselkorn, who is not a licensed medical provider. Ursulova also allegedly concealed Safir's illegal ownership and Alexander Haselkorn's incapacity from insurance companies. Between July 2016 and July 2017, Safir and his co-conspirators allegedly fraudulently obtained over $1 million through their operation of Jamaica Wellness. To further conceal his illegal ownership of the clinic, Safir allegedly cashed over $380,000 in checks payable to Jamaica Wellness at a Brooklyn-based check-casher in a one-year period. The Attorney General's 61-count indictment, unsealed today in Kings County Supreme Court, charges various defendants with Money Laundering in the Second Degree (a class C felony), Insurance Fraud in the Third Degree (a class D felony), Grand Larceny in the Third Degree (a class D felony), Grand Larceny in the Fourth Degree (a class E felony), Unauthorized Practice of a Profession (a class E felony), Falsifying Business Records in the First Degree (a class E felony), Scheme to Defraud in the First Degree (a class E felony), and Practicing or Appearing as Attorney-at-Law without being admitted and registered (a class A misdemeanor). If convicted of the top counts charged, David Safir faces up to 5 to 15 years in prison. The Haselkorns, Ursulova, and Grinage each face up to 2 1/3 to 7 years in prison. David Safir and Theron Grinage were arraigned on November 13, 2018. Dr. Alexander Haselkorn, Roberta Haselkorn, and Nadezhda Ursulova were arraigned today in Kings County Supreme Court. The Honorable Judge Danny Chun set bail in the amount of $1 million bond or $250,000 cash for defendant Safir; $100,000 bond or $50,000 cash for defendant Ursulova; $15,000 bond or $7,500 cash for defendants Dr. Alexander Haselkorn and Roberta Haselkorn; and $10,000 bond or $5,000 cash for defendant Grinage. The Attorney General thanks the New York City Department of Investigation, the New York City Police Department's Internal Affairs Bureau, the New York State Department of Financial Services, the National Insurance Crime Bureau, and insurance carriers Met Life & Home, GEICO, Liberty Mutual, and Amica Mutual for their assistance in this matter. The case is being prosecuted by Assistant Attorneys General Carey Spitalnick and Sarah Cohen of the Auto Insurance Fraud Unit, with the assistance of Supervising Legal Analyst Paul Strocko, Legal Analyst Caitlin Carmody, and Legal Analyst Yuriy Kurbatov. The Auto Insurance Fraud Unit is led by Unit Chief Gabriel Tapalaga. The Criminal Enforcement and Financial Crimes Bureau is led by Bureau Chief Stephanie Swenton and Deputy Bureau Chief Joseph G. D'Arrigo. 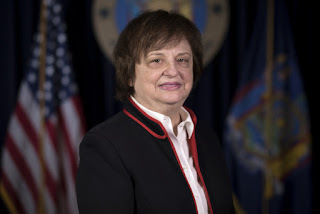 The Division of Criminal Justice is led by Executive Deputy Attorney General Margaret Garnett. The case was investigated by OAG Investigator John Roman, under the direction of Supervising Investigators Edward Keegan and Natalie Shifrin and Deputy Chief Leonard D'Alessandro. The Investigations Bureau is led by Chief Dominick Zarrella. Audit work was performed by Forensic Auditor Andre Hartley of the Forensic Audit Section. The Forensic Audit Section is led by Deputy Chief Sandy Bizzarro and Chief Edward J. Keegan.